A long freight train it’s into the train yard, all the workers get in and the engineer opens the throttle: the train starts to pull away from the yard when they realize the caboose has a problem. The brake is frozen on one of the wheels of the caboose. The wheel is being dragged and there’s sparks and smoke. Someone standing there says, “Stop the train.” So, they manage to signal to the engineer to stop the train. They can’t fix it, so they just cut the caboose loose. They remove it and they give him the go ahead. He gives it the throttle. The train doesn’t move. He gives it more throttle. It doesn’t move. What’s happening is the train isn’t moving, but his wheels are spinning. The cars aren’t moving. There’s nothing wrong with any of the remaining cars and there’s nothing wrong with the engine, but there is something wrong with the engineer. The question is, what’s wrong? The problem was that when the train attempted to start with the caboose brake on, it stretched all the inter-car couplings so that the whole train was just like one big car. At this point, the friction from the engine train wheels was not enough to get the whole thing going. Instead, you need to just get one car moving at a time – this is why there is space between the couplings. 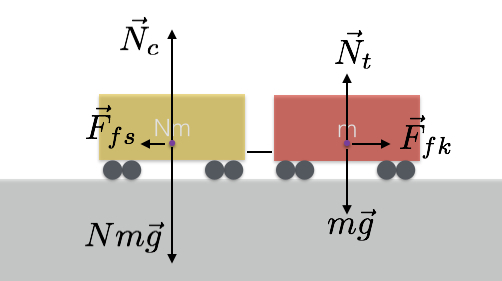 In general, the kinetic friction is less than the static friction. This means it would take less force to slide something at a constant velocity than it would to get it moving. The frictional force on the engine is between the wheels and the track. The frictional force on the cars is between the axle and the wheels. As long as the frictional force on the engine is greater than the frictional force on all the cars, the whole system can accelerate. Consider a train with 10 cars in which all the cars have stretched couplings. This would make it just like one big rigid object. To get the train moving the frictional force on the engine should be 10 times greater than the frictional force on each car. This is simply impossible! This is why the only way to get a train moving is to get one car moving at a time. This way, once a car is moving, the axle-wheel interaction changes from static to kinetic so the frictional force of the moving cars becomes smaller and the frictional force on the engine can be greater than the frictional force on all the cars. New London-Paris Super Train. Top Speed of 320km/h. How Track Circuits detect and protect trains: download your PDF copy!